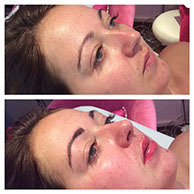 Bring out your best features with our professional semi-permanent make-up and cosmetic tattooing service in Norwich. If you’ve had an illness resulting in hair loss, such as alopecia, semi-permanent make up is a great way of rebuilding self-esteem. Or perhaps you want to emulate the look of your favourite TV personalities and many of the girls from The Only Way is Essex, who create their looks with semi-permanent make-up! Whatever your reason for choosing it, the one thing customers will have in common is the personalised and professional service they receive from Gemma each and every time. Gemma’s passion, talents and ability to achieve the best results for every individual customer is just one of the reasons that customers come back to Gemma time and time again. The latest trend for bold brows has made its way from the catwalk to celebrities and now the High Street. 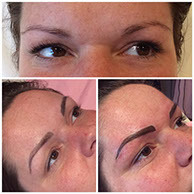 Gemma was one of the first trained HD Brow stylists in Norwich and Norfolk and was trained by the founder of this rapidly growing brand, Nilam Patel. 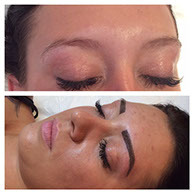 Gemma’s specific knowledge and experience within this field is a great advantage, creating beautiful semi-permanent HD eyebrows for clients’, tailored to suit individual face shapes. Bold brows can totally transform your face. 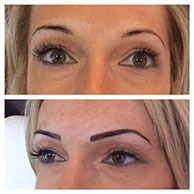 If you live in Norfolk and would like a HD Brows consultation, please get in touch. Gemma has been offering professional beauty treatments since 2008 and, following customer demand added semi-permanent make up treatments and cosmetic tattooing in 2014. She has her very own purpose built beauty room in Taverham, Norwich, where you can enjoy a relaxing experience, while Gemma brings out your best features. With a degree in Business Administration, NVQ 4 in management, training from Finishing Touches semi-permanent make up experts and a whole host of professional beauty qualifications, Gemma has built up a growing list of loyal and satisfied customers in the Norwich area and further afield. Please call her on 07795 663394 or email info@gemmabee.co.uk to find out how she can help you. Semi-permanent make up can save you a huge amount of time, in fact a leading London based clinic found that the average woman spends 1 year and three months of their lives putting on cosmetics! 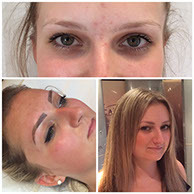 Gemma is one of only a handful of beauty professionals offering semi-permanent make-up treatments in Norwich and Norfolk. Treatments last between 3-5 years with colour boosts recommended every 12-18 months to keep them looking their best. Young or old, male or female, we’ve transformed lots of eyelashes, eyebrows and lips with semi-permanent make up following hair loss, alopecia or to really make customers’ favourite features stand out. You’d be surprised how much difference eyebrows make to your whole face and the way you look. Whether you have sparse eyebrows, thin eyebrows or even no eyebrows due to illness or alopecia, semi-permanent eyebrows can lift, shape and frame your face and even turn back the clock making you look younger for longer without having to result to drastic measures like surgery. For defined yet realistic eyebrows, our advanced brow technology can you give the eyebrow shapes and appearance you’ve always wanted. From hair stroke tattoos, that give the illusion of precise individual hair strokes used to create a naturally defined arch, to a powdered brow that combines hair strokes with shading or if you’re after a stronger look, go for the block brow. Gemma will begin by assessing your skin tones to ensure she chooses a pigment that will balance perfectly with your skin. This step requires skill and experience to achieve the desired result. You will explain to Gemma what type of brows you are looking for. 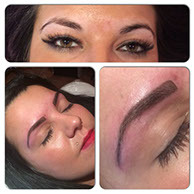 You will be fully involved in the creation of your brows; we can discuss and advise, or look at pictures with you. Your facial dimensions and brows will be measured, so that taking your desired effect into account, Gemma will be able to give you a result that is most flattering for your bone structure. 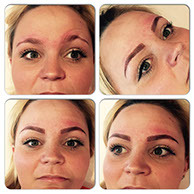 By penciling in your chosen brows you will be able to try them out before we get started. Anesthetic is used to ensure that you will be as comfortable as possible throughout your treatment. How the process feels obviously varies from person to person, but most people describe it as a little ‘scratchy’. Gemma will use her signature technique to replicate the appearance of actual hairs in the skin in the design agreed with you. Final adjustments will be made, hair by hair, to ensure your new brows are flattering and achieve the effect that you were looking for. Please be aware that the colour will fade by more than 50% after the initial application - this is to see how well the pigment adheres to your skin and to adjust the colour if necessary. 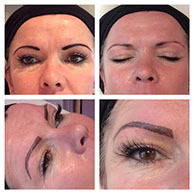 You will be offered a retouch appointment, within 12 weeks of the initial application, to enable Gemma to review your brows with you and make any adjustments necessary to perfect the overall effect. A cautious approach enables ensures that you will end up with brows you love. Without aftercare, the pigments used will eventually fade out of the skin. In order to maintain your brows, we do recommend that you come back at least once a year for an annual retouch to keep the colour refreshed and make any adjustments necessary to keep the effect you desired. Your eyes are the first thing most people see when they look at you so make sure you’re making the most of one of your best assets with semi-permanent eye liner and eyelash enhancement. Fed up of having to top up your faded or smudged lip liner and lipstick all the time? 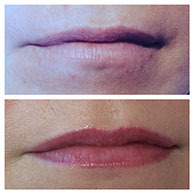 For perfectly defined lips all day, and all night for that matter, semi-permanent lip treatments can define, highlight or brighten your face in a flash. As we age, our lips become less defined and faded. 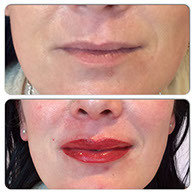 So, if you want to give your lips a new lease of life or enhance your already luscious lips a semi-permanent lip liner tattoo can give great definition whilst a lip blush can give the illusion of fuller lips, or for a more dramatic effect go for a semi-permanent full lip colour. Check out what some of our lovely customers have to say about Gemma. "Anyone who hasn't got Semi Permant Eyebrows is a deffo must have. Had my 1st sitting in January & top up in Febuary. I am soo pleased with the end result and would highly recommend Gemma Bee to anyone." "Had my brows done by Gemma. She’s a lovely lady, very professional and made me feel at ease. It’s the best thing I have ever done as my brows were very thin and had gaps in them so no more pencil! Take a look at our gallery to see our before and after shots of our lovely ladies and gents. Bee Pampered is situated in Taverham, which is located on the outskirts of Norwich on the main B1067 Fakenham Road. If you’d like more information on any of our treatments or would like to book a consultation please get in touch using the contact form or call us on 07795 663394.